Stephen Leahy is an award-winning environmental journalist who’s taken a particular interest in what he calls the “hidden world of virtual water” that surrounds us. 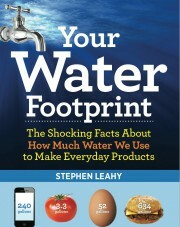 In his new book, Your Water Footprint: The Shocking Facts About How Much Water We Use To Make Everyday Products, he illustrates the somewhat mysterious concept of virtual water using plenty of graphics and photographs of food, clothing, electronics and other products we use everyday. We recently asked Stephen about his book, his suggestions for what readers can do and how his own water footprint measures up. What is it about water footprints that compelled you to write your book? In more than 20 years of environmental journalism I have written many articles about water and water issues but never about water footprints. So when the publisher contacted me about doing a book on water footprints I dug into the subject and was amazed at how we’re literally surrounded by a hidden world of virtual water — water we can’t see but is a real as the water we drink. Are there any items that you researched but just couldn’t come up with water footprint data? Yes. Calculating water footprints can be very complex, especially for products made of many different materials. While there are many estimates of the water footprints of cars, I was unable to get a definitive one that included everything and provided detailed explanation of how the calculation was done. Virtual water can be a difficult concept to explain. Have you found any particular ways that help people understand the difference between direct and virtual water use? I wrote and rewrote my explanation in the book and give examples such as a detailed explanation of how much virtual and direct water is used to make a bottle of cola. Once armed with their new knowledge about water footprints, what should readers do? My hope with Your Water Footprint is to give readers enough information to make water-wise choices to reduce their water use which will not only save money but also be prepared for shortages and ensure our children and grandchildren will have abundant fresh water. This is all about smart substitutions and changes, rather than sacrifice and self-denial. How do you respond to those who critique the water footprint concept? For example, we’ve heard some say that we never “lose” water because it’s just moving around the water cycle, or ask whether we’re all supposed to stop eating because all food requires water? That’s a misunderstanding of the concept. While it is true that water is not lost forever, it can be used or consumed so that it can’t be used by anyone else. I use the word ‘consumed’ to make it clear this is water that can no longer be used for anything else or no longer available for use on a human time scale. Water can often be cleaned or reused, so those amounts of water are NOT included in the water footprints in the book. We hear about carbon footprints, ecological footprints, water footprints….should or can we tie these together? Ecological footprints try to tie carbon, water and other footprints together which is very helpful but difficult to do. One challenge is that water footprints vary a great deal from place to place. Wheat grown in a desert region like California has a bigger footprint than that in a wetter region like central Canada. So we have to ask: What’s your water footprint, and do you have a resolution to shrink it? My water footprint is pretty low. I love vegetarian food and only eat meat on rare, special occasions. Most of my shopping including clothes and some electronics are done in second hand or thrift shops. When I buy something new like a pair of shoes, I make sure they are of very good quality and will last many years. In addition to low-flow showers and toilets and avoiding food waste, the key to shrinking your water footprint is reduce, reuse and recycle the products we use. This entry was posted in energy, environment, food, Uncategorized, Water, water footprint and tagged beef, clothes, cotton, drought, electricity, Energy, Flood, food, hidden water, meat, virtual water, Water, water expert, water footprint, water scarcity, water shortage, what you can do by Stephen. Bookmark the permalink.